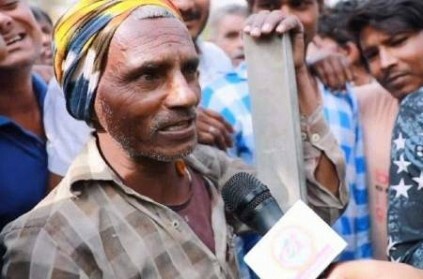 It's election time and everyone wants to speak out their mind, be it for any person or party - so did this daily wage labourer from Bihar who shocked the crowd by speaking in English. In a video that has gone viral online shows reporter Saurabh Tripathi of Hindi news organisation "The Lallantop" interviewing the man as a part of its Lok Sabha Elections 2019 coverage and his views on it. "I want to work. I want to work and want to say to Modi to allow for work. I don’t get daily work and without food, I have to sleep. Modi sarkar, koi kahan kar raha hai rozgaar ka upay? (sic)” He further says, "Rozgari, Indira Gandhi ke time pe badiya thi, abhi Modi ke time pe bhi badiya hai. Location, work, and position, everything was good but now it is not great," the labourer said. These few lines shocked and impressed the reporter to which he asked with a one-word question: "English?" The self-assured man retorts, "Yes, why not?" Further speaking about himself, the labourer said that he is a graduate from Bhagalpur University. He further went on to compare Prime Minister Narendra Modi's government with former Prime Minister Indira Gandhi's. He said "Modi is best in modern time, but in ancient time, at that time Indira Gandhi was the best." After listening to him, the crowd cheered loudly while the reporter hailing him saying, "Gazab English bol rahe hain bhai sahab toh (He is speaking good English)." In minutes of this video being uploaded, it got over 2 million views and also garnered over 5,000 comments from impressed netizens all across the country. ‘சொல்லிப் பாரு’.. ஊர் பஞ்சாயத்தில் மூன்றாவது முறை தலாக் சொன்னதும், கணவரை வெளுத்து வாங்கிய மனைவி! ’வேண்டாம்; எனக்கு கடவுள் வெகுமதி கொடுப்பார்’: கூலி தொழிலாளிக்கு குவியும் புகழாரங்கள்! திடீரென ஆபரேஷன் தியேட்டருக்குள் புகுந்து ’கால் துண்டை’ கவ்விக்கொண்டு ஓடிய நாய்! ‘அவர்களும் மனிதர்கள்தான்.. காவலர்கள் ஏன் தூங்கினார்கள்?’:டி.ஐ.ஜி விளக்கம்! 'மணமகன் தப்பி ஓடியதால்'.. மாமனாரை திருமணம் செய்த மணமகள்! கலப்பு திருமணம் செய்த பெண்ணிற்கு அடி உதை:பெற்றோரும் பார்த்து ரசித்த கொடூரம்! கடன் வாங்கி லாட்டரி வாங்கியவருக்கு அடித்தது ஜாக்பாட்! This page contains news relating to various facts and events. The views are generally about current affiars and general topics in diversified areas such as political, international, national, and regional issues, sports, health, travel, lifestyle, technology and business. People having similar interets on the above topics will find this page useful. Bihar Labourer stuns Crowd By Talking In English: Watch Video | India News.